Manage a single, centralised source for all of the font resources you have. Minimise inconsistencies through robust permissions and automatically distribute fonts to your teams. Universal Type Server Makes it easy for them to find, activate, and use the fonts they need, when they need them. Universal Type Server is simple to set up and maintain. It works seamlessly within your network and with your professional tool set, including industry-standard tech from Adobe, Quark, Apple, and Microsoft. Keeps Your Organisation Safe and Legal. Ensure your users have legal access to the fonts they need to get their jobs done while keeping unlicensed fonts out. 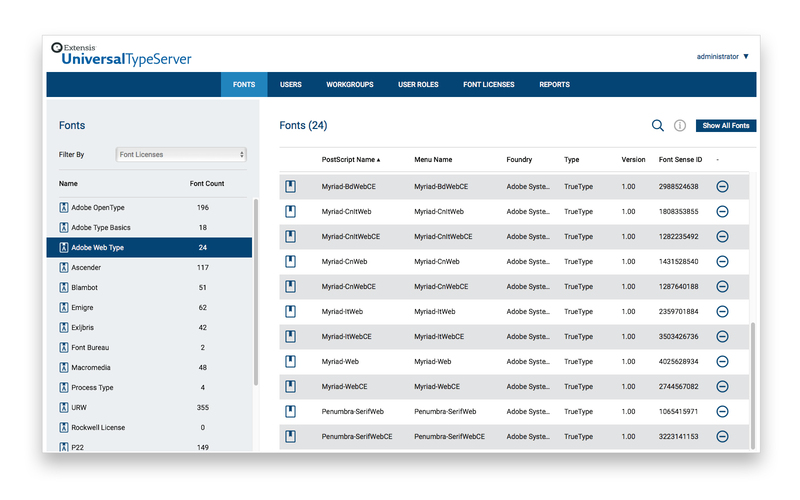 Universal Type Servers lets you systematically keep track of your licences, ultimately protecting your organisation from font misuse and costly lawsuits. Understand your team’s font usage with easy-to-understand reports. You’ll get quantifiable data that provides insight, guides your font licensing decisions, and can identify areas of unnecessary costs. Contact our professional team at RGB Solutions to find out more.